Unscrupulous elements in various towns and cities in Haryana are running a parallel administration, forcibly extorting “goonda tax” from advertisers from outside the state. Justifying the “arbitrary” levy of “fine” or “tax”, these local “tax collectors”, many claiming to be close to politicians, even issue receipts saying that they have taken contracts from the local municipalities for collection of ‘advertising tax”. Nearly a month after the announcement of sugarcane rates, the Haryana Government is yet to notify these even as the crushing season is already underway and farmers are demanding a further hike in the procurement prices. The BJP’s commitment to stand by the HJC in the next general election and support the candidature of HJC president Kuldip Bishnoi as the chief ministerial candidate has come at a time when the INLD leadership is contemplating winning back the BJP as its alliance partner. Today’s HJC rally at Sirsa has serious political implications for both the Lok Sabha and Vidhan Sabha elections in 2014. The rally can be seen both as commitment for an alliance as well as BJP’s move to hardsell itself to the INLD. With a view to overcoming the practical difficulty in providing financial incentive to beneficiaries under the Inter-Caste Marriage Scheme, the state government has modified the procedure for sanctioning the assistance. A married woman was allegedly burnt to death late last night by her in-laws in Garh Shahjahanpur village. The victim, Niveditta, got married to Gopal two years ago. The Haryana Government has forwarded a Rs 666.6 crore Mewat canal project to the Central Water Commission for appraisal to supply water for irrigation and drinking purposes in Mewat. The state government has signed a memorandum of understanding (MoU) with M/s IVRCL Assets and Holding Limited for development of Rs 1605-crore Rai Malikpur (Rajasthan border)-Narnaul-Mahendragarh-Dadri-Bhiwani-Kharak corridor in the state. The 151-km corridor is likely to be completed within two-and-a-half years . The city residents have approached President Pranab Mukherjee urging him to intervene and save Aravali forest. They claimed that no positive response from Haryana Government had been received so far. Haryana is all set to get rapid expansion of rail transportation services, said Rohtak MP Deepender Singh Hooda while addressing public meetings at Gorar and Bidhlan villages on Saturday evening. 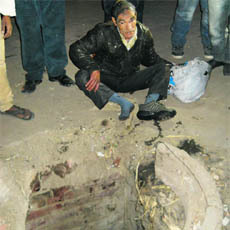 The Public Health Department has not learnt any lessons from accidents due to open manholes in the past, as an elderly watchman fell in one such “death hole” near Main Post Office here on Friday night. The Khol police has registered a case of embezzlement against a cashier of the Kund branch of the Punjab National Bank. The dharna by members of the Contractual Instructors Welfare Association of Haryana entered its 10th day here today. The protesters have threatened to continue their stir till the sacking of the President of the association was revoked and their demands were met by the authorities concerned. A majority of these cases pertain to signboards manufactured in neighbouring states. When these advertising signboards in the form of glow signs or banners or posters are sent for delivery, the vehicles with non-state number plates are identified and stopped and asked for “fine” or “tax” from Rs 4000 to Rs 10,000, depending upon the driver’s paying capacity . Reports from Panipat, Sonepat, Kaithal and many other cities suggest that whenever a fabricator sends an advertisement board for installation, “self-proclaimed tax collectors” demand money in the name of “advertising tax”. In some cases, the vehicles are illegally taken into custody by these “tax collectors” and there are cases where they have had their way by shooing away the police claiming to be close to local politicians. Though, these “tax collectors” claim to have been authorised for collecting tax by local municipal councils, they have, however, failed to show any letter or agreement with the civic authorities to this effect. Senior government functionaries feigned ignorance about the issue, saying that there are provisions under the Municipal Council (Control of Advertisement) By-Laws where tax can be collected on account of installation of advertisement boards from the person who is displaying these advertisements, but not by sub-contractors or any other unauthorised person. The scale of the tax collection can be guaged from the fact that two receipts bearing numbers 2127 dated 18-8-2012 and receipt number 2503 dated 24-11-2012 by one Global Advertising, Panipat, where Rs 4,000 and Rs 8,000 were charged, suggest that just one tax collector recovered varying amounts of money from about 376 persons over three months from one receipt book. Different employees of the “tax collector” carry different receipt books and the amount recovered without any legal sanctity runs into crores. The receipts have been issued in the name of Khaitan Electic Private Limited, Surya Advertising etc to suggest that the tax has been collected from the end- user whereas this has been collected from manufacturers of signboards during delivery of the signage. In most cases, the receipt does not even carry the address of the “tax collector”. 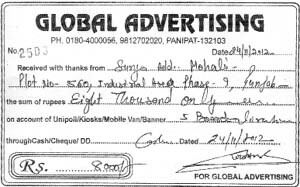 In this particular case, the receipt says “Global Advertising, Panipat” and a handwritten entry says tax has been collected for “Display Board Charges” or “ 5 Board displays”. A senior official said that “the action of private self-proclaimed tax collection contractors in demanding and recovering advertisement tax in connivance with the municipal authorities is absolutely arbitrary and illegal”. Other officers also pointed out that no tax was required to be paid in cases where an advertisement pertains to trade, profession or business carried on within the land or building upon or over which such advertisement is exhibited irrespective of its size. The Haryana Sugarcane Control Board had proposed the price of early maturing varieties of sugarcane as Rs 251 against Rs 231 per quintal last year, Rs 240 as against Rs 226 for mid-maturing varieties and Rs 235 against Rs 221 for late maturing varieties. Effecting a hike of nearly Rs 20 per quintal early last month, the board had ensured that the rates being offered in the state remained higher than that of Punjab. However, despite the substantial hike, the rates have failed to enthuse the farmers and the opposition alike. The two have been demanding a further hike of around Rs 50 so that the farmer gets Rs 300 per quintal given the spiraling prices of not only agricultural inputs but of everyday needs. This demand, on the lines of the demand of cane farmers of Maharashtra, has been raised during a few sporadic protests. Sources in the board said the delay in the issuance of a notification had nothing to do with the reconsideration of the demand being voiced from certain quarters. “As far as the rates are concerned, they are final. The decision to fix this rate was taken after consulting the government top brass. Officials of Sugar Fed and mill owners were present during the meeting chaired by the Agriculture Minister in the second week of November,” said an official. The board officials further said they have received no formal representation to reconsider the rates, which are already higher than those being offered in Punjab for all three varieties. “Any demand for a further hike, based on the demand of farmers of Maharashtra, is unjustified because we have a sugar recovery of 9.1 per cent against over 13 per cent recovery from cane produced in Maharashtra. We fluctuate around 9 per cent, give or take 0.25 per cent, season after season. The total recovery, including molasses and other by products is not more than 20 per cent in Haryana,” said an official. Though the crushing season has taken off, the failure of the government to notify the rates was beginning to give a false hope to the farmers. According to sources, the minutes of the board meeting were received late last week and would most certainly be notified this coming week. Thereby, dashing all hopes. “The notification of the rates is a formality. The farmers are well aware of the rates they will be getting for their produce. At present, crushing has already begun in 10 mills of Haryana,” said an official. Like they say nothing is impossible in politics, INLD supremo Om Parkash Chautala has been cursing the BJP in private and in public, but at the same time he has been working overtime in maintaining contact with the BJP’s national leadership. During Divali, he reportedly went to greet many BJP national leaders. Chautala’s efforts to woo the BJP have their roots in the 1987 general election where the Lok Dal-BJP alliance secured 85 of the 90 assembly seats. Though there is every possibility that the BJP will stay with the HJC in the hope that the party can repeat the 1996 results when the Haryana Vikas Party (HVP) led by Bansi Lal and supported by the BJP formed the government with the INLD coming second in terms of number of seats. But there is also a likelihood that the BJP leaders who have made the commitment to Bishnoi in Sirsa today may not be in prime positions of the party. In the 1999 parliamentary poll, the BJP broke away from the HVP and formed an alliance with the INLD. Of the 10 Lok Sabha seats, the BJP and INLD secured five seats each. They remained together in the 2000 Vidhan Sabha elections and formed the government with an overwhelming majority. But as both parties began to get ambitious, they parted ways in 2004, losing all 10 parliamentary seats to the Congress. Since the bitterness between the two continued through the 2005 assembly elections, the Congress formed the government with a comfortable margin. After today’s announcement of the BJP of maintaining the alliance and supporting Kuldip Bishnoi as the chief ministerial candidate, the scenario in Haryana indicates that the next elections will see a triangular contest in all 90 seats. But the problem the HJC-BJP alliance is likely to face is that both parties have a predominantly urban vote bank and it is estimated that there are at least 60 seats where the two parties will have a direct clash among ticket aspirants. From the BJP’s perspective, the next parliamentary poll is more important than the Vidhan Sabha elections. If the BJP stays with the HJC, it gets to contest eight Lok Sabha seats, leaving the remaining two to the HJC. But in case of any alliance with the INLD, the two parties will have to work on the previous formula of contesting five seats each. The BJP would obviously like to contest the maximum number of seats in the parliamentary elections. It is pertinent to mention that the BJP has an alliance with the SAD in neighboring Punjab. Since the SAD patron considered Chautala’s father Devi Lal as his brother, the SAD can play a role in forging an alliance between the BJP and the INLD. It goes without saying that the BJP has a larger cadre base in the state than the HJC. Therefore, the possibility of the BJP opting for the INLD in place of the HJC at the last moment to ensure greater political participation and better results with an eye on the Treasury Benches in Parliament cannot be ruled out. Chautala’s repeated comments that the INLD can form an alliance with anyone other than the Congress suggest that he will keep his options open to regain power in the state. The BJP leadership is divided on the issue of an alliance with the INLD with those eyeing the Lok Sabha supporting it and those looking at the Vidhan Sabha opposing it. An official spokesman said here today that the power to sanction the assistance and to make the payment under the scheme had been given to District Welfare Officer concerned instead of the Deputy Commissioner. Now the entire amount of Rs 50,000 would be given in cash through RTGs in the married couple’s joint account instead of giving Rs 20,000 and the remaining Rs 30,000 in the form of a joint fixed deposit for six years. He said the other terms and conditions of the scheme would remain unchanged. On a complaint filed by her father, Ved Ram of Hukam Singh Mandi in Gohana, a case has been registered at the Mahila Police Station against her husband Gopal, his father Dharam Pal, mother Ram Piari, his elder brother Bhopal and Bhopal’s wife Sunita. An official spokesman here today said while there was a plan to construct four dams on the Ghaggar river and its tributaries, one such dam, Kaushalya Dam costing Rs 217 crore, had already been completed. The Kaushalya Dam will help in augmentation of drinking water supply in Panchkula district. The Haryana Urban Development Authority has already laid the pipeline to supply its water and the construction work of a treatment plant is under progress. He said the other three dams included Renuka, Kishau and Lakhwar Vyasi. The state government has taken up the issue of their construction with the Central Government. The government has got declared the Renuka Dam as a national project and the state government has also got Rs 25 crore deposited for the same. He said during the tenure of present government since March 2005, with the assistance of NABARD, 652 schemes of construction of new canals, expansion of old canals, improvement of water courses and construction of drains to control floods had been completed and work was in progress on 179 other such schemes. He said to meet the growing demand of water of the industrial towns of Gurgaon, Manesar, Bahadurgarh, Kharkhauda and Jhajjar, a National Capital Region Water Supply Channel costing Rs 322 crore had been constructed. He said with a view to expand irrigation facilities in southern Haryana, the capacity of pump houses of lift irrigation schemes was being increased at a cost of Rs 51.40 crore and the work would be completed by March 2013. The capacity of Jawahar Lal Nehru Feeder has been increased from 1,500 cusecs to 2,500 cusecs. An area of 400 sq km along the feeder has seepage of water, therefore there is a proposal to set up shallow tubewells on both sides of the feeder and their water would be taken to the feeder thus, saving 4,000 hectares of land of eight villages from the problem of seepage. The corridor would be developed on a design, build, finance, operate and transfer (DBFOT) basis. Chief Secretary PK Chaudhery said this corridor would serve as a major inter-state North-South link between the states like Rajasthan, Gujarat and Maharashtra to northern states such as Punjab, Himachal Pradesh, Jammu and Kashmir, besides Haryana. In a letter sent to Pranab Mukherjee, the Gurgaon Progressive Forum has highlighted the issue of Aravali forest being converted into an agricultural zone along with rampant construction on the storm water drains. The environmental and financial losses to the state and public due to the non-availability of storm water drains are huge. The negligence in this matter and favouritism towards builders, commercial ventures (petrol pumps) and other activities is leading to damage to the Southern Peripheral Road (SPR), which is flooded in the rainy reason and damaged throughout the remaining year. The land acquisition for Badshahpur drain and storm water drain along the SPR has not been initiated so far. Now with the Haryana Government converting 34,793 hectares of land, which is a sizeable share of the Aravali forest, into agricultural land, the concrete jungles of Gurgaon and neighbouring areas are bound to choke further. It appears to be an attempt to pave the way for future construction in the area, which should have ideally been deemed as a forestland or an open space. The area has been included in the agricultural zone, stated the letter. He said the tenure of Chief Minister Bhupinder Singh Hooda would be written as an era of rail projects in the history of the state. Gurgaon and Faridabad had already been linked with Metro services and it had also been sanctioned for Bahadurgah, he said. Besides three major rail projects, Sonepat to Jind, Rewari to Rohtak and Rohtak to Hansi, he said, the rapid rail transportation service to Rohtak, Hisar, Sonepat, Panipat, Faridabad, Palwal and Alwar from Delhi would give a boost to development and public welfare activities in the state. He chided the opposition parties for issuing false statements on state’s economy and said the Planning Commission report had proven that Haryana was the fastest growing in the country and the state was on right path of progress. Haryana figured at top of all the progressive and developmental parameters in the report, he added. Deepender said the Planning Commission report had categorically stated that Haryana’s borrowings in the last five years had been Rs 2,206 crore less than the projected borrowings as predicted by the Planning Commission for 11th Five Year Plan, he added. A youth, Anil, who worked at a confectionary shop, heard a man crying for help at 10 last night and found the sound coming from inside an open manhole. When he looked inside the manhole, he saw a man struggling to save himself and crying for help in about 15-foot- deep main sewer manhole. He sought help of some passersby and managed to take the man out with the help of a rope. City Police SHO Suresh Pal, who was on patrol duty, also reached there and helped in the rescue operation. The victim, Kharak Singh, who sustained injuries on his hands and feet, said he was employed as a helper at a shop in the day and worked as watchman in the night to eke a living for his family. Due to darkness in the night, he failed to notice an open manhole and fell in it. Last night’s incident suggest that the authorities had not learnt any lessons from the past. A 5-year boy had lost his life, as he accidentally fell in an uncovered sewer manhole in the town in February last year. The Public Health authorities, however, never fixed any liability for the loss of life nor did they take any action against any of its officials. Rather, senior officers of the department attributed the death to victim's own negligence, who, they said, was not looking ahead while walking. Angad Bishnoi, Superintending Engineer of the Public Health Department, did not respond to the calls made on his mobile phone. Deputy Commissioner J Ganesan said he had given clear instructions that the official in whose area a manhole was found open would be personally held liable for it. In a complaint to the police, bank manager Chander Prakash Yadav stated that cashier Hanuman Prasad, a resident of Mahendergarh district, fraudulently took away Rs 6.80 lakh of a number of account holders of the bank in September and the first week of October this year. When customers handed over money to the cashier to be deposited in their accounts, he allegedly pocketed the money himself. The customers came to know about the fraud when they went to withdraw money from their accounts.